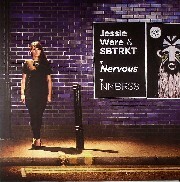 Prolific masked producer SBTRKT introduces vocalist Jessie Ware for their debut collaboration 'Nervous', released on Numbers. Heralding the arrival of a new UK vocal talent, Nervous is a stirring update on UK Garage music, fusing the floor ready sensibilities of SBTRKT with a strong debut from Jessie. The combination of SBTRKT’s dextrous drum programming, Ware’s stunning voice and a rude 80s Boogie bass line gel together into a heavyweight production that is set to become one of the most distinctive club hits of 2010. Nervous is proving a firm favourite in sets from DJs across the board, including Oneman on Rinse FM through to Martelo and Ministry of Sound’s Ross Allen. Producer Mark Ronson was recently overheard asking for a track ID. The closing track ‘Fright’ sees SBTRKT fly solo with a late-night stepper overflowing with Motor City melancholy and pulsing sub weight.